It’s that time again…2012 is nearly over! As the year ends, there is not a better time to look back at our successes in our last blog post of 2012. This year it’s a bit more difficult to tell which blog posts were most popular due to our website redesign in July, but there were some clear trends to keep in mind for 2013. One interesting thing to note is that all of the below posts focus on hospitality marketing although we do occasionally cover topics in overall marketing as well. Keep reading as I reveal our most popular posts from 2012, and insights on why they continue to bring traffic to our blog every day! I was surprised to find that this post is currently our most-viewed in 2012. This just shows the power of TripAdvisor in today’s world of hospitality marketing. According to the sites own statistics, a staggering 72% of travelers start looking for a hotel or simply just travel advice on TripAdvisor. In addition, over 40 million people visit Trip Advisor every month, making it undoubtedly the number one travel site worldwide and one of the most popular hotel review sites. Renee’s blog post covered the new “full review” widget and its potential to change the way travelers review hotels. There is no question that hotel reviews are an extremely important part of hotel marketing today and further, that management needs to respond accordingly to select reviews. Our second most popular post of 2012 happens to also be a guest post by Kenji Crosland. The topic of the post is unconventional for our blog as instead of covering hotel marketing, it instead focused on unique services hotels provide to their guests. Thanks to a bit of creativity, and a lot of time focused on building karma on popular social networking site reddit, this post continues to bring traffic to our blog months later. So don’t be afraid to try something new and let someone else write for your blog every once in awhile; your readers may appreciate a new topic and fresh voice! Once again, Pinterest is a popular blog topic. 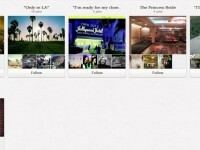 My post on board ideas for hotels on Pinterest is our third most-viewed blog this year. Clearly,the social networking site and its focus on images is a hot topic, and the basis for many site redesigns throughout 2012. Pinterest has shown that it is not just a fad and continues to hold a dominant place in social media marketing. My post on hospitality and technology blogs that hoteliers should be reading is our fourth most viewed post this year. Hopefully this means hoteliers are reading this post, and then bookmarking these sites to read every day! Another popular trend of 2012 is the movement towards mobile and tablets. Our fifth most popular post this year written by Renee shares how hotels can use tablets on property to impress guests and improve customer service. Have a great holiday break, everyone!